PMA-PCR kits are designed for selective detection of viable bacteria from a specific strain using PMA dye and real-time PCR. 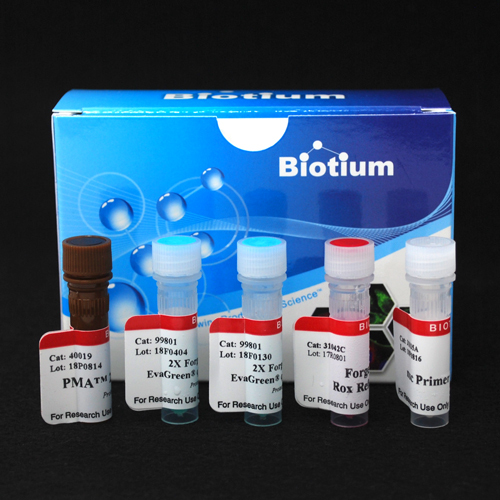 The kits contain PMA dye, Forget-Me-Not™ qPCR Master Mix, and PCR primers for detection of selected strains of bacteria that are of widespread interest to food safety, public health, and/or antibacterial research. This kit contains primers for amplification of the methicillin resistance gene mecA, which confers methicillin-resistance in Staphyloccoccus aureus and other bacterial species. The kit includes reagents sufficient to treat 80 bacterial cultures with PMA and perform 200 PCR reactions. The number of samples that can be treated with PMA using the kit may vary depending on sample type. See the product protocol under the downloads tab and references for more information. PMA is a high affinity photoreactive DNA binding dye developed by Biotium. The dye is weakly fluorescent by itself but becomes highly fluorescent upon binding to nucleic acids. It preferentially binds to dsDNA with high affinity. Upon photolysis, the photoreactive azido group on the dye is converted to a highly reactive nitrene radical, which readily reacts with any hydrocarbon moiety at the binding site to form a stable covalent nitrogen-carbon bond, thus resulting in permanent DNA modification. The dye is cell membrane-impermeable and thus can be used to selectively modify DNA from dead cells with compromised membrane integrity, while leaving DNA from viable cells intact. PMA inhibits PCR amplification of modified DNA templates by a combination of removal of modified DNA during purification and inhibition of template amplification by DNA polymerases (see Reference 1 under the references tab). Consequently the dye is useful in the selective detection of viable pathogenic cells by quantitative real-time PCR. Forget-Me-Not™ qPCR Master Mix is a hot-start EvaGreen® dye-based master mix for use in real time PCR applications and DNA melt curve analysis. Forget-Me-Not™ master mix contains a low concentration of blue dye which allows you to see at a glance whether you forgot to add master mix to any of your tubes, so you can catch pipetting mistakes and avoid wasting time, reagents, and your precious DNA samples. It is formulated for qPCR using a fast cycling protocol, but also can be used for qPCR using regular cycling protocols. EvaGreen® dye is a unique DNA-binding dye with features ideal for both qPCR and melt curve analysis. EvaGreen® dye binds to dsDNA via a novel “release-on-demand” mechanism, which permits the use of a relatively high dye concentration in qPCR without PCR inhibition. Forget-Me-Not™ Master Mix contains Cheetah™ Taq, Biotium’s fast-activating chemically-modified hot-start Taq polymerase, which is particularly suitable for fast PCR cycling protocols. Staphylococcus aureus is an anaerobic gram negative bacterium that can cause of a variety of infections in humans, and methicillin-resistant S. aureus is a rising cause of hospital-acquired infections. The mecA gene confers methicillin-resistance in S. aureus and other methicillin-resistant bacterial species. The mecA primers included in the kit have been used for detection of methicillin-resistant S. aureus (reference 2), and have been validated for qPCR using Biotium’s Forget-Me-Not™ Master Mix (see product protocol). Note that the mecA primers are not specific to S. aureus, because mecA is expressed by other methicillin-resistant bacteria. Biotium also offers the Staphylococcus aureus (nuc) PMA-PCR kit, which includes primers against the S. aureus-specific nuc gene, expressed by methicillin-susceptible and methicillin-resistant S. aureus strains. Also see our other PMA-PCR kits for detection of E. coli, E. coli strain 0157:H7, Salmonella enterica, Listeria monocytogenes, Legionella pneumophila, and Mycobacterium tuburculosis. Don’t see your favorite strain? Let us know at techsupport@biotium.com. 1. Nocker A, et al. Comparison of propidium monoazide with ethidium monoazide for differentiation of live vs. dead bacteria by selective removal of DNA from dead cells. J. Microbiol. Meth. 67(2), 310-320 (2006). 2. Fang H and Hedin G. Rapid screening and identification of methicillin-resistant Staphylococcus aureus from clinical samples by selective-broth and real-time PCR assay. J. Clin. Microbiol. 41(7), 2894-9 (2003). 3. Fittipaldi M, et al. Progress in understanding preferential detection of live cells using viability dyes in combination with DNA amplification. J. Microbiol. Meth. 91(2), 276-289 (2012).